What’s in there is what you’d expect—16 pages of good news from the Middle Kingdom. 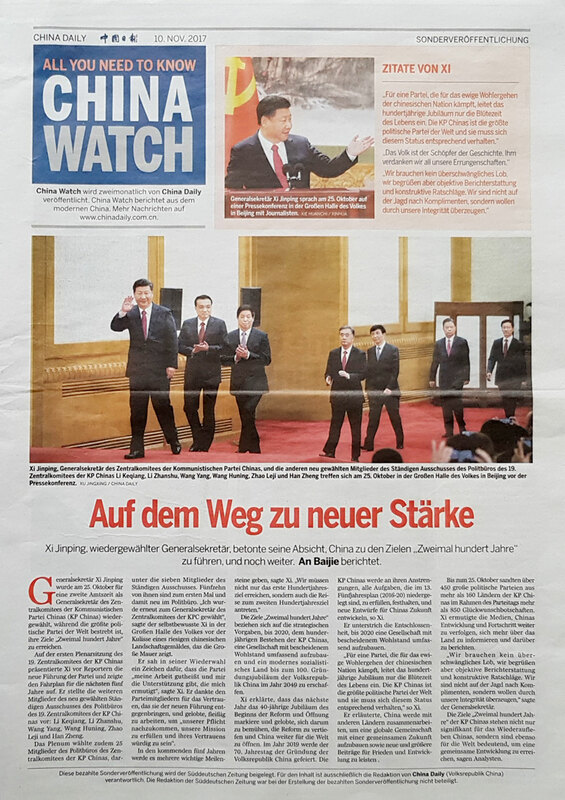 The title article includes not one but two photos of Xi Jinping while the headline boasts that the country “is gaining new strength.” Naturally, they could not leave out the panda bears in the Berlin Zoo or German ex-pats celebrating Oktoberfest in China, their beer mugs in hand. And right in the middle you’ll find an enormous chart entitled “The Communist Party of China in Figures.” Pure propaganda from an authoritarian regime distributed in Western mass media. What is the difference, one feels compelled to ask, between Facebook and Twitter ads apparently paid for by Russia (and which exerted massive influence on the American presidential election) and the publication of a China Daily supplement in the Süddeutsche Zeitung? The China Daily supplement, however, is not an isolated case. 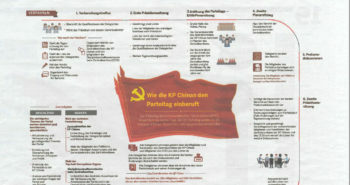 In July, the Süddeutsche Zeitung published a multi-page ad from the Chinese state agency Xinhua, just in time for the G20 Summit. The editorial board of the Süddeutsche Zeitung at least must have known who it was dealing with, either by reading its own paper or from – apparently cozy – meetings with representatives of the Chinese state media, for example, at the now expanded “Mediaforum China-Germany-USA” established by the Robert Bosch Foundation and which we’ve already written about (German language blog). Perhaps they laid the groundwork for further business at, for example, the fun-loving table top soccer game with the “enemies of press freedom”? The Chinese state media are not such good sports when it comes to dissent and pluralism. For example, they actively took part in blackmailing human rights activists, bloggers, book dealers, and journalists into making “confessions” and publicly humiliating them. 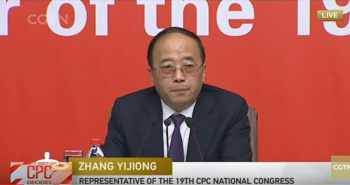 These methods, reminiscent of the Cultural Revolution, violate to an extreme degree the human rights, personal rights, and liberty of those they target. They intimidate dissenters and doubtlessly intensify the climate of repression under Xi Jinping. China Daily and Xinhua, state-run media, are an integral part of this repression. The Süddeutsche Zeitung, if it really wishes to produce quality journalism and preserve its credibility as an independent paper, cannot publish the propaganda of authoritarian states guilty of egregious human rights violations. In this particular case, they also must disclose what the Chinese state media paid for advertising and supplements. 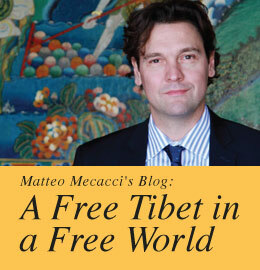 The International Campaign for Tibet in Germany has urged the paper’s editorial board to rethink their policies accordingly. In Germany, the door to authoritarian policies and ideas has been thrown wide open—ironically also by those who see themselves as the pillar of democratic societies and who should clearly be so: the media, universities, even NGOs. Will there be a change in thinking before it’s too late? 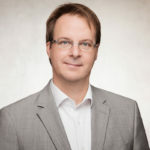 Before joining the International Campaign for Tibet in 2005 as Executive Director in Germany, Kai Mueller served on the board of Amnesty International Germany and worked as research associate in the German parliament. He heads the Berlin office of ICT. Since 2015, he also coordinates ICT's United Nations initiatives.